Manager Ron Gardenhire called it a punch in the gut. 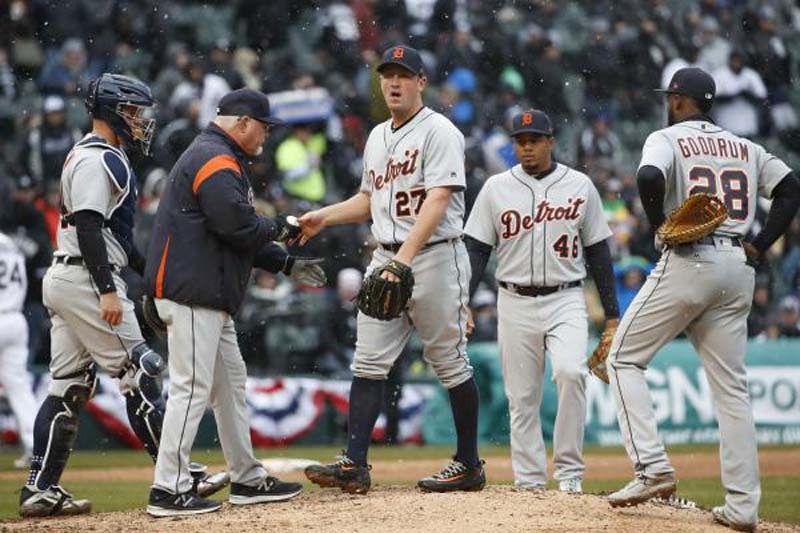 The staggering Detroit Tigers now have to find a way to recover quickly and end their six-game losing streak. Nicholas Castellanos' three-run homer gave Detroit a 4-1 lead against the Oakland A's on Monday, but the bullpen couldn't hold it. Oakland finished off the rally with Jed Lowrie's solo homer in the ninth inning against Tigers closer Shane Greene. The teams match up again on Tuesday night. The Tigers' slide began during a two-game series in Cincinnati. They were outscored 26-3 while getting swept in a three-game series at Cleveland before Monday's late collapse. "We all knew this was going to be a work in progress," Gardenhire said. "You're going to go through some ups and downs. "Believe me, these (ones) are getting kicked in the gut right here because we really worked at it today and we had a lot of good moments. We didn't have too many in Cleveland. These are the ones the challenge you. These guys will learn from this and we'll get better from it, I hope, but it doesn't make us feel any better today. We'll come back and regroup tomorrow." For the most part, the back end of Detroit's bullpen has been reliable. Main setup man Joe Jimenez hadn't given up a run in nine one-inning appearances this month before allowing three in the eighth. Greene hadn't given up a run in 10 of his previous 11 outings. "That hadn't happened in a long time," Gardenhire said, referring to Jimenez's outing. "Probably early in the season was the last time he's done anything like that and kind of had to fight it a little bit. Who knows? Maybe it's because they haven't been pitching enough lately. We went through a stretch where we didn't use those guys four or five days and maybe that's it, a little rusty." Oakland's power display continued as Stephen Piscotty homered earlier in the game. The A's have now homered in 26 straight road games, a major league record. Frankie Montas, who has been Oakland's most effective starter for the past month, will oppose Blaine Hardy in the second game of the four-game series. Montas (4-1, 2.41 ERA) has produced four quality starts in five outings since being recalled from Triple-A Nashville in late May. He has allowed just one run in 14 2/3 innings in two road starts, including his last appearance at San Diego on Wednesday. The Padres only managed one run with five hits in 6 2/3 innings and Montas had six strikeouts. He's 1-2 with a 7.88 ERA in three career outings against Detroit, including two starts. Hardy (3-1, 3.30 ERA) jumped into the Detroit rotation when Jordan Zimmermann and Francisco Liriano were on the disabled list. With both of those veterans back, Hardy is now part of temporary six-man rotation. He made six consecutive starts and allowed two or fewer runs in five of them before a relief appearance in Cincinnati on Wednesday. He faced four batters against the Reds and recorded only one out. Hardy has made 10 career relief appearances against the A's, posting a 1-0 record and a 1.74 ERA.